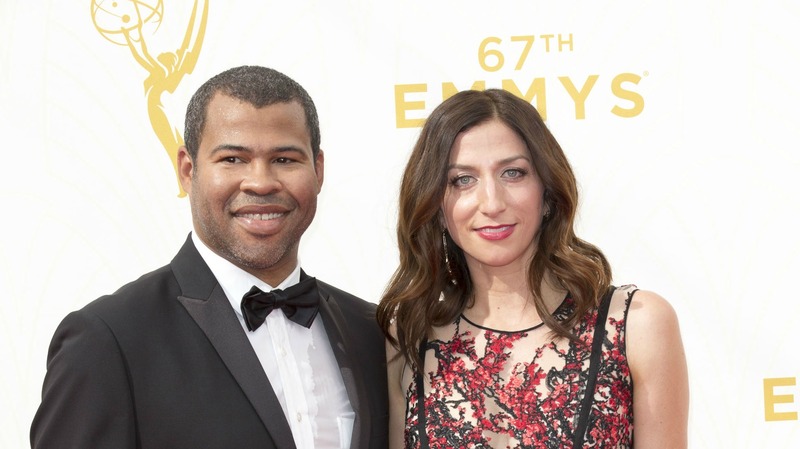 Brooklyn Nine-Nine star Chelsea Peretti and Key and Peele star Jordan Peele are married. Congrats! But if you’re thinking to yourself right now, “Wait, I didn’t even know they were dating,” you’re not alone. In November 2015, Peele announced that he and Peretti were engaged. Peele cut right to the chase by simply tagging Peretti on Twitter and adding a diamond ring emoji. Modern love. Peretti also sent out a tweet about the good news. Awww. So cute! But can we discuss their relationship for a sec here? Again, not many people even knew they were dating. Good for them for maintaining a shred of privacy. Buuuuuut of course, thanks to the trusty Internet, we were able to dig up some info about this cute couple’s relationship. Here are six things to know about the future Mr. and Mrs. Peele. Or, more likely, the future Mr. and Mrs. Peele and Peretti. Because people apparently have a lot of free time on their hands, Wikipedia managed to update Peele’s page shortly after news broke that he and Peretti were engaged. Peele retweeted a message from a fan — along with a funny comment — that showed the new info on his page, so evidently he’s not disputing anything that’s been added. Oh, Internet. @chelseaperetti @JordanPeele congratulations, you two. You are such a cool couple. A slew of actors and actresses tweeted out their congratulatory messages to the couple — including Sandra Bernhard, Henry Winkler, T-Pain, and Tatum O’Neal. But of course, none as cool as Mindy Kaling. Another story claims that Peretti’s Brooklyn Nine-Nine co-star Andy Samberg had a hand in hooking the pair up. A source told Dish Nation, “As soon as Andy learned that Jordan expressed an interest in Chelsea he was on it. Andy knew this was a great match so he made it very simple — he told Chelsea that Jordan was a good man and she needed to give him a shot. Before you knew it, the two of them were hooking up and now they’re inseparable.” Whichever way is true, one thing is for certain: Awwwww. ‘Nuff said. Actually, no. Adorable. Now, ’nuff said. Peele and Peretti eloped “a bit ago” and announced the marriage on Peretti’s Instagram — no details given or required, besides the fact that their adorable pup was in attendance. Peele later confirmed the marriage in an appearance on Late Night With Seth Meyers, while Peretti chimed in on Twitter: “wud rather be called wifi than wifey — sounds way more important.” Ah, two comedians in love. Did you know these two were dating?